Junior development programmes in northern Papua New Guinea have gained momentum with the inaugural Northern Zone Regional Championships recently showcasing PNG’s next generation of Australian football talent. The championships featured boys’ U13, U15 and U17 divisions in addition to an exhibition match of schoolgirl football that augers well for the future. They also showcased the newly-formed Goroka and Daulo junior leagues that kicked off in April this year and are proving to be very successful. The regional championships are part of AFL-PNG’s elite group development programmes, which provide an opportunity for the most talented juniors to progress to a national development level and perhaps one day represent Papua New Guinea. An U17 squad selected at the championships will attend a national training camp in January 2005 that will identify very talented players who presumably could be available for promotion to the rookie list of Australian Football League clubs. The U15 squad will compete at the inaugural AFL-PNG Zone National Championship in Port Moresby from September 30th-October 3rd. 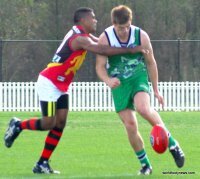 From this an U16 national side will be selected to tour Queensland in April 2005. The U13 squad will attend an Easter training camp in the capital that will select the PNG U14 team for 2005. Also on the cards for PNG football is the possibility of a challenge match between AFL-PNG and AFL-Queensland schoolgirls in 2006. AFL-Goroka Junior Development Officer Jacob Nibil has been encouraging other centres in the north to allow girls to participate and benefit from the junior programmes. Nibil went on to stress the fundraising effort required to meet the costs of flying squads to the capital so that they can continue their development. Corporate bodies or organisations wishing to sponsor or support the players with airfares can contact Nibil on (+675) 732 167. Full squad lists from the championships can be viewed here. Subsequent to the above article, a news article in The National reveals that AFL-PNG has recently organised the first of several exhibition Australian football matches involving junior girls from Port Moresby. A part of the AFL-Port Moresby junior development programme, involved teams representing Taurama, Ted Diro Primary, St. Peter's Chanel, Kilakila, Wardstrip and Morata Primary took part in the matches. The final will be held on Saturday at Amini Park in Port Moresby. And in addition to the above post, further news from The National reveals that Australian football is making an impact amongst youths in the remote Western Highlands village of Balk in PNG. A club named Kera Doa has been registered with AFL-PNG, lead by Cletus Topa, Joseph Paul and Rev. Moses Kar. The club's aim is to engage young people through 'Rules football'. “Through the AFL’s development programme these youths are restricted from unacceptable behaviour and other forms of drugs, alcohol and criminal activities,” said Topa. Kera Doa will be sending an Under 18 and a senior team to the PNG National AFL Championships in Lae in September this year.